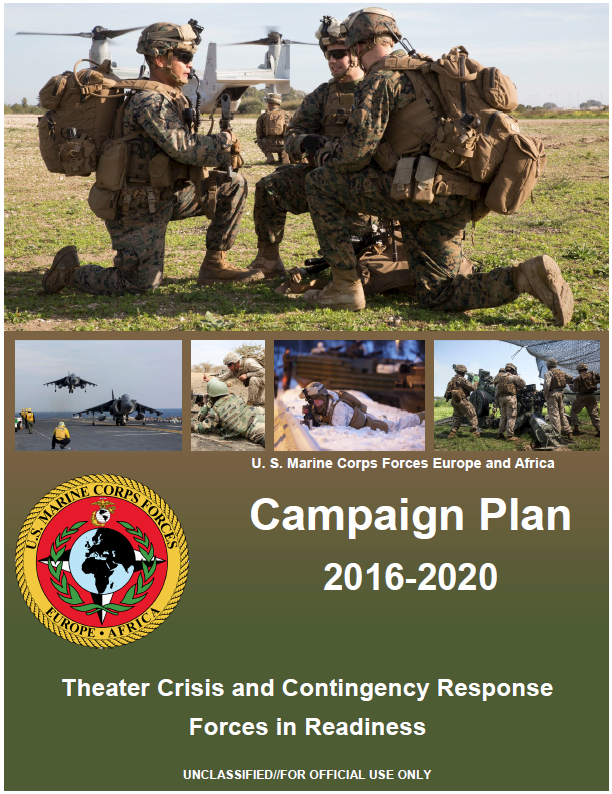 The following campaign plan was obtained from the U.S. Marine Corps Forces Europe & Africa website. The Campaign Plan will be supported by Fiscal Year Implementation Plans that will further refine the guidance of the multi-year Campaign Plan into detailed single-year Plans of Action and Milestones (POA&Ms) with specific tasking to MARFOREUR/AF staff sections and subordinate commands. While the most dangerous challenges facing MARFOREUR/AF are associated with USEUCOM contingencies, the most likely are associated with crises in USAFRICOM. Since World War II, European allies and partners have worked with the United States to achieve security and stability, and Europe continues to be critical to U.S. national security interests around the globe. Growing instability, however, is being fueled by aggressive Russian behavior and NATO is undergoing a profound historical change to address a diversity of European and global challenges. Africa remains an enduring interest for the United States and its importance will continue to increase as African economies, population, and influence grow. Our engagement now can assist our African partners in realizing their potential and gaining the capability to solve African problems. African solutions to African problems are in the best interest of Africans, Americans, and indeed the world. After nearly a quarter century of relative geopolitical stability, Europe is entering a new strategic era that reflects a return to great superpower competition. (5) intensified efforts to build partner capacity for newer NATO members and other partners. Russia and Eastern Europe: Russia poses a long-term existential threat to the United States and our allies and partners in Europe. Russian intimidation of the Baltic states, revitalization of its Arctic bases, and aggressive actions in the air, at sea and in cyberspace are the cause of much concern. Meanwhile, Russia continues to develop advanced military systems that seek to threaten our advantages in specific areas and, in some cases, they’re developing weapons and tactics, techniques, and procedures (TTP) that seek to achieve their objectives rapidly, in an effort to deny our ability to respond. The Levant: The emergence of the Islamic State is a significant regional development as the group now controls substantial portions of Iraq and Syria through its rapid para-military expansion and growth in resources. Internal strife in Syria continues to fuel the group amid sectarian friction, at great cost to human life. Syria has become a magnet for global jihad; a situation that is likely to persist. Ongoing, severe spillover effects include a flood of refugees and an influx of foreign fighters into neighboring countries and throughout Europe. Israel is in a region of growing instability, surrounded by adversaries in the West Bank, Gaza, Sinai Peninsula, and southern Lebanon. Continued U.S. political and security guarantees have left our strategic partnership with Israel unshaken, as Israel will be a key ally with which to coordinate efforts to minimize extremist influence in the broader Levant. The Arctic: The Arctic is at a critical point in its transformation from a relatively isolated region to one where receding ice is enabling increased human access. As climate change and the variability of new energy sources shape the global environment, these shifts will affect our strategic outlook, especially in the Arctic. As more countries operate in the Arctic, more opportunities and challenges will arise. The United States is committed to working with allies and partners to keep the region stable and secure through this historic change. U.S. Naval forces are uniquely capable of conducting operations across the vast distances, remote outposts, scarce infrastructure, and seasonal challenges present in the Arctic.